Chaplin in costume as "The Tramp"
Sir Charles Spencer Chaplin, Jr. Order of the British Empire (KBE) (April 16, 1889 – December 25, 1977), better known as Charlie Chaplin, was an English comedic actor who became one of the most iconic performers in the twentieth century, as well as a notable film director. He is considered to be one of the finest mime artists and clowns on film and has greatly influenced performers in this field. His principal character, The Little Tramp, was an endearing vagrant in an undersized coat, oversized trousers, bowler hat, cane, and brushy mustache, with the refined manners of a gentleman. Chaplin was one of the founders of United Artists Studios and he maintained artistic control over most aspects of his films. He acted in, directed, scripted, produced, and eventually even scored his own films. His working life in entertainment spanned over 65 years, from the Victorian stage and music hall in England as a child performer, almost until his death at the age of 88. Chaplin's concern for the underprivileged, and modernist awareness of the deracinating influence of technology in such films as Modern Times would lead him into sympathy with communist causes and political controversy. His sometimes scandalous private life and marriages to a series of much younger women anticipated the trend among Hollywood stars to trivialize marriage and family in their personal lives and, increasingly, in film. Chaplin won two honorary Academy Awards for his achievements as an actor and filmmaker and was knighted at age 85 by Queen Elizabeth II. Charlie Chaplin was born on April 16, 1889, on East Street, Walworth, London. His parents, both entertainers in the Music Hall tradition, separated before he was three. Chaplin lived with his mother, Hannah, and his older brother at various addresses and he had little contact with his alcoholic father, Charles Chaplin Senior. Chaplin's father died when the boy was only 12, leaving him and his older half-brother, Sydney Chaplin, in the sole care of his mother. Hannah Chaplin suffered from schizophrenia, and was eventually admitted to the Cane Hill Asylum at Coulsdon. Chaplin had to be left to the workhouse at Lambeth, London. He moved after several weeks to the Central London District School for paupers in Hanwell. The young Chaplin brothers forged a close relationship to survive. They gravitated to the Music Hall while still very young, and both proved to have considerable natural stage talent. 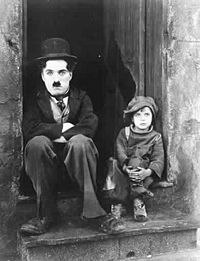 Chaplin's early years of desperate poverty were a great influence on the characters and themes of his films and in later years he would revisit the scenes of his childhood deprivation in Lambeth. Unknown to Charlie and Sydney until years later, they had a half-brother through their mother, Wheeler Dryden, who was raised abroad by his father. He was later reconciled with the family, and worked for Chaplin at his Hollywood studio. Chaplin's mother died in 1928, in Hollywood, seven years after being brought to the United States by her sons. Chaplin first took to the stage in 1894, when, at the age of five, he gave an impromptu performance at a theater in Aldershot, standing in for his mother. As a child, he was confined to a bed for weeks due to a serious illness, and, at night, his mother would sit at the window and act out what was going on outside. His first professional work came when he joined The Eight Lancashire Lads, a troupe of dancers who played the music halls of Great Britain. In 1900, at the age of 11, his half-brother Sydney helped get him the role of a comic cat in the pantomime Cinderella at the London Hippodrome. In 1903 he appeared in Jim: A Romance of Cockayne, followed by his first regular job as the newspaper boy Billy in Sherlock Holmes, a part he played into 1906. This was followed by Casey's Court Circus variety show, and the following year he became a clown in Fred Karno's Fun Factory slapstick comedy company, where Chaplin became the star of the troupe. Chaplin first toured America with the Karno troupe from 1910 to 1912. He spent five months in England and then returned for a second tour in the United States with the Karno Troupe on October 2, 1912. Arthur Stanley Jefferson, later known as the comic actor Stan Laurel, was in the Karno Company, and the two wound up sharing a room in a boarding house. Laurel returned to England but Chaplin remained in the United States. In late 1913, Chaplin's act with the Karno Troupe was seen by film producer Mack Sennett, who hired him for his studio, the Keystone Studios. Chaplin's first appearance on film was in Making a Living, a one-reel comedy released on February 2, 1914. I had no idea what makeup to put on. I did not like my get-up as the press reporter (in Making a Living). However, on the way to the wardrobe I thought I would dress in baggy pants, big shoes, a cane and a derby hat. I wanted everything to be a contradiction: The pants baggy, the coat tight, the hat small and the shoes large. I was undecided whether to look old or young, but remembering Sennet had expected me to be a much older man, I added a small mustache, which I reasoned, would add age without hiding my expression. I had no idea of the character. But the moment I was dressed, the clothes and the makeup made me feel the person he was. I began to know him, and by the time I walked on stage he was fully born (Chaplin, My Autobiography: 154). By the end of his year at Keystone, Chaplin was directing and editing his own short films. These were an immediate, runaway success with the public, and even today Chaplin's standout screen presence in these films is apparent. In 1915, he began a year's contract with Essanay Film Studios and further developed his film skills, adding new levels of depth and pathos to the Keystone-style slapstick. He signed a lucrative deal with the Mutual Film Corporation in 1916, to produce a dozen two-reel comedies. He was given near complete artistic control and produced twelve films over an eighteen month period that rank among the most influential comedy films in cinema. Chaplin later said the Mutual period was the happiest of his career. At the conclusion of the Mutual contract in 1917, Chaplin signed a contract with First National to produce eight two-reel films from 1918 until 1923). First National financed and distributed these pictures but otherwise gave him complete creative control over production. Chaplin built his own Hollywood studio and using his independence, created a remarkable, timeless body of work that remains entertaining and influential. The First National films include the comedy shorts: A Dog's Life (1918), and Pay Day (1922); longer films, such as: Shoulder Arms (1918) and The Pilgrim (1923); and the feature-length classic, The Kid (1921). 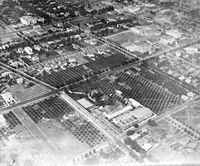 In 1919, Chaplin co-founded the United Artists film distribution company with Mary Pickford, Douglas Fairbanks and D.W. Griffith, all of whom were seeking to escape the growing power consolidation of film distributors and financiers in the developing Hollywood studio system. This move, along with complete control of his film production through his studio, assured Chaplin's independence as a filmmaker. He served on the board of United Artists until the early 1950s. All Chaplin's United Artists pictures were of feature length, beginning with A Woman of Paris (1923). This was followed by the classic The Gold Rush (1925), and The Circus (1928). After the arrival of sound films, he made what is considered to be his greatest film, City Lights (1931), as well as Modern Times (1936) before he committed to sound. These were essentially silent films scored with his own music and sound effects. City Lights contained arguably his most perfect balance of comedy and sentimentality. Critic James Agee in a Life Magazine review called Chaplin's performance in the final scene the "greatest single piece of acting ever committed to celluloid." His other dialog films made in Hollywood were The Great Dictator (1940), Monsieur Verdoux (1947), and Limelight (1952). Modern Times (1936) depicts the dismal situation of workers and the poor in industrial society. The Eating Machine scene depicts the dehumanizing effect of mechanization. While Modern Times (1936) is a non-talkie, it does contain talk—usually coming from inanimate objects such as a radio or a television monitor. This was done to help 1930s audiences, who were out of the habit of watching silent films, adjust to not hearing dialogue. 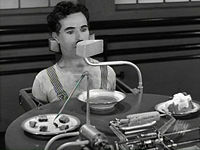 Modern Times was the first film where Chaplin's voice is heard (in the nonsense song at the end). However, for most viewers it is still considered a silent film—and the end of an era. Although "talkies" became the dominant mode of movie making soon after they were introduced in 1927, Chaplin resisted making such a film all through the 1930s. It is a tribute to Chaplin's versatility that he also has one film credit for choreography for the 1952 film Limelight, and another as a singer for the title music of the 1928's The Circus. The best-known of several songs he composed is "Smile," composed for the film Modern Times and given lyrics to help promote a 1950s revival of the film, famously covered by Nat King Cole. This Is My Song from Chaplin's last film, A Countess From Hong Kong, was a number one hit in several different languages in the 1960s (most notably the version by Petula Clark), and Chaplin's theme from Limelight was a hit in the 50s under the title Eternally. Chaplin's score to Limelight was nominated for an Academy Award in 1972, due to a decades-long delay in the film premiering in Los Angeles making it eligible. "The Great Dictator" (1940). Chaplin played a fascist dictator clearly modeled on Hitler. Chaplin came out of comic character to directly address the audience at the conclusion of The Great Dictator (1940). His first dialogue picture, The Great Dictator (1940), was an act of defiance against Adolf Hitler and Nazism, filmed and released in the United States one year before it abandoned its policy of isolationism to enter World War II. The film was seen as an act of courage in the political environment of the time, both for its ridicule of Nazism and for the portrayal of overt Jewish characters and the depiction of their persecution. Chaplin played the role of both a Nazi dictator clearly modeled on Hitler, and also that of a Jewish barber cruelly persecuted by the Nazis. Hitler, who was a great fan of movies, is known to have seen the film twice (records were kept of movies ordered for his personal theatre). Chaplin's political sympathies always lay with the left. In the 1940s his views (in conjunction with his influence, fame, and status in the United States as a resident foreigner) were seen by many as dangerously leftist. His silent films made prior to the Great Depression typically did not contain overt political themes or messages, apart from the Tramp's plight in poverty and his run-ins with the law. But his films made in the 1930s were more openly political. Modern Times depicts workers and poor people in dismal conditions. The final dramatic speech in The Great Dictator, which was critical of blindly following patriotic nationalism, and his vocal public support for the opening of a second European front in 1942 to assist the Soviet Union in World War II, were controversial. In at least one of those speeches, according to a contemporary account in the Daily Worker, he intimated that Communism might sweep the world after the war and equated it with "human progress." Charlie Chaplin and Mahatma Gandhi in London, 1931. Apart from the controversial 1942 speeches, Chaplin declined to patriotically support the war effort as he had done for the First World War (although his two sons saw service in the Army in Europe), which led to public anger. For most of the war, he was fighting serious criminal and civil charges related to his involvement with actress Joan Berry, in which he fought a paternity suit and charges of transporting a woman across state lines for immoral purposes under the Mann Act. After the war, the critical view towards what he regarded as capitalism in his 1947 black comedy, Monsieur Verdoux led to increased hostility, with the film being the subject of protests in many American cities. As a result, Chaplin's final film, Limelight, was less political and more autobiographical in nature. His following European-made film, A King in New York (1957), satirized the political persecution and paranoia that had forced him to leave the United States five years earlier (one of the few films of the 1950s to do so). After this film, Chaplin lost interest in making overt political statements, later saying that comedians and clowns should be "above politics." 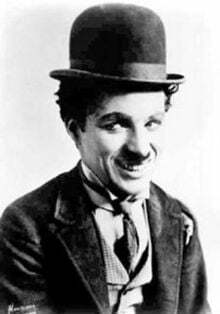 Although Chaplin had his major successes in the United States and was a resident from 1914 to 1952, he always retained his British nationality. During the era of McCarthyism, Chaplin was accused of "un-American activities" and came under suspicion as a communist sympathizer. J. Edgar Hoover, who had instructed the Federal Bureau of Investigation to keep extensive secret files on him, tried to end his United States residency. FBI pressure on Chaplin grew after his 1942 campaign for a second European front in the war and reached a height in the late 1940s, when Congressional figures threatened to call him as a witness in hearings. This was never done, possibly from the fear of Chaplin's ability to lampoon the investigators. In 1952, Chaplin left the United States for what was intended as a brief trip home to England. Hoover learned of it and negotiated with the Immigration and Naturalization Service to revoke his re-entry permit. Chaplin then decided to stay in Europe, and made his home in Vevey, Switzerland. He briefly returned to the United States in April 1972, with his wife, to receive an Honorary Oscar. Even though he was invited by the Academy of Motion Picture Arts and Sciences, he was only issued a one-time entry visa valid for a period of two months. However, by this time the animosities towards the now elderly and apolitical Chaplin had faded, and his visit was a triumphant success. Chaplin and Jackie Coogan in The Kid (1921). Chaplin won two honorary Academy Awards. When the first Oscars were awarded on May 16, 1929, the voting audit procedures that now exist had not yet been put into place, and the categories were still very fluid. Chaplin had originally been nominated for both Best Actor and Best Comedy Directing for his movie The Circus, but his name was withdrawn and the Academy decided to give him a special award "for versatility and genius in acting, writing, directing and producing The Circus" instead. The other film to receive a special award that year was The Jazz Singer. Chaplin's second honorary award came 44 years later in 1972, and was for "the incalculable effect he has had in making motion pictures the art form of this century." Upon receiving the award, Chaplin received the longest standing ovation in Academy Award history, lasting a full five minutes, from the studio audience. Chaplin was also nominated for Best Picture, Best Actor, and Best Original Screenplay for The Great Dictator, and again for Best Original Screenplay for Monsieur Verdoux (1947). During his active years as a filmmaker, Chaplin expressed disdain for the Academy Awards. His son Charles Jr. wrote that Chaplin invoked the ire of the Academy in the 1930s, by jokingly using his 1929 Oscar as a doorstop. This might explain why City Lights, considered by several polls to be one of the greatest of all motion pictures, was not nominated for a single Academy Award. It is sometimes overlooked that Chaplin also won a competitive Academy Award. In 1973, he received an Oscar for the original music score for the 1952 film, Limelight, which co-starred Claire Bloom. The film also features a cameo role with Buster Keaton, which was the only time the two great comedians ever appeared together. Because of Chaplin's political difficulties, the film did not play a one-week theatrical engagement in Los Angeles—a criterion for nomination—until 1972. Chaplin's two final films were made in London: A King in New York (1957) in which he starred, and (as writer and director) A Countess from Hong Kong (1967), starring Sophia Loren and Marlon Brando, in which Chaplin made his final on-screen appearance in a brief cameo role as a seasick steward. In his autobiographical book, My Life in Pictures, published in 1974, Chaplin indicated that he had written a screenplay for his youngest daughter, Victoria. Entitled The Freak, the film would have cast Victoria as an angel. According to Chaplin, a script was completed and pre-production rehearsals had already begun on the film (the book includes a photograph of Victoria in costume) but were halted when Victoria got married. "I mean to make it some day," Chaplin wrote; however, his health declined steadily in the 1970s and he died before this could happen. One of the last known works Chaplin completed was in 1976 when he composed a new score for his unsuccessful 1923 film A Woman of Paris. Chaplin had many relationships with women, some supportive, some extremely difficult. He was married four times. Chaplin was 29 when he married his first wife, Mildred Harris, a 16-year-old child-actress, on October 23, 1918. The marriage lasted two years and resulted in one son, Norman Spencer Chaplin, who survived only three days. At age 35 Chaplin met and married 16-year-old Lita Grey on November 26, 1924. The union was a disaster resulting in a sensational divorce and then record-breaking settlement of $825,000, on top of $1 million in legal fees. They had two sons and divorced in 1927. Chaplin's third marriage was to Paulette Goddard in 1936. His last marriage was Chaplin's happiest union. On June 16, 1943 at 57 years old, he married 17-year-old Oona O'Neil, daughter of the playwright Eugene O'Neil. Oona remained his wife the rest of Chaplin's life. They gave each other what each needed, she longed for the love of a father figure, and Chaplin craved her loyalty and support as his public popularity declined. They had eight children, three sons and five daughters. He was named in the New Year's Honors List in 1975 and, on March 4, was knighted at the age of 85 as a Knight Commander of the British Empire (KBE) by Queen Elizabeth II. The honor was first proposed in 1931, and again in 1956, when it was vetoed by the then Conservative government for fears of damage to relations with the United States at the height of the Cold War and the planned invasion of the Suez. Chaplin's robust health began to slowly fail in the late 1960s, after the completion of his final film A Countess of Hong Kong. In his final years he grew increasingly frail, and died in his sleep on Christmas Day 1977, in Vevey, Switzerland, at age 88. He was interred in Corsier-Sur-Vevey Cemetery in Corsier-Sur-Vevey, Vaud. On March 1, 1978, his body was stolen by a small group of Polish and Bulgarian mechanics in an attempt to extort money from his family. The plot failed, the robbers were captured, and the body was recovered 11 weeks later near Lake Geneva (and reburied under six feet of concrete to prevent another attempt). 82. The Chaplin Revue (Sep 1) (First National shorts A Dog’s Life, Shoulder Arms and The Pilgrim edited together by Chaplin to form a single feature-length film). ↑ BBC, The tramp and the dictator, BBC Four Documentaries. Retrieved March 24, 2007. ↑ Stephen J. Whitfield, The Culture of the Cold War (The Johns Hopkins University Press, 1996, ISBN 0801851963). ↑ Internet Movie Database,  Biography for Charles Chaplin], Internet Movie Database. Retrieved March 24, 2007. Chaplin, Charles. My Autobiography (Chaplin). Simon & Schuster, 1964. ISBN 0671782401. Chaplin, Charles. Die Geschichte meines Lebens. Fischer-Verlag, 1964. (Germ.) ISBN 3596244609. Chaplin, Charles. My Life in Pictures. Bodley Head, 1974. ISBN 0448148382. "S. Frind: Die Sprache als Propagandainstrument des Nationalsozialismus," in: Muttersprache 76. Jg., 1966, S. 129-135. (Germ.). Klemperer, Victor. LTI - Notizbuch eines Philologen. Leipzig: Reclam, 1990. ISBN 3379001252. Robinson, David. Chaplin: His Life and Art. McGraw-Hill, 2001. ISBN 0070531811. Vance, Jeffrey. Chaplin: Genius of the Cinema. New York: Abrams, 2003. ISBN 0810945320. Whitfield, Stephen J. The Culture of the Cold War. Baltimore: The Johns Hopkins University Press, 1996. ISBN 0801851963. This page was last modified on 7 February 2017, at 16:28.